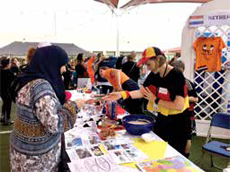 Dhahran — Dhahran Hills School launched its first International Day fair to celebrate the diversity of the student body, drawing more than 3,000 visitors. Each of “51 nations” that participated in the fair showcased its characteristic, uniqueness, and culture through food, costumes, posters, artifacts, languages, games, dance, art, and decorations on Feb. 27. The outdoor festival at the school’s covered playground was organized and executed for the first time by parents, said Sadia Yousufi, a mother who led a team to prepare for this event starting in October last year. The number of visitors was a tenfold increase of what the school had expected. “It feels surreal. We had only expected some 300 to 400 visitors. The turnout far exceeded our expectation,” said Tabitha Pugh, who is a teacher, parent, and another one of the organizers. 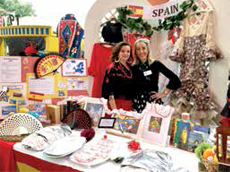 Teresa Munoz (left) and her friend Katia Elices were dressed in traditional attire from Spain for the International Day. They put out art, instruments, books, and food at the table to represent Spain. Silke Port, a parent from Germany, is ready to serve a traditional dish from her country to a visitor at her table representing Germany and the Netherlands. 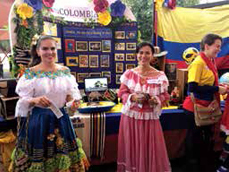 Samara Solano (left) and Cristina Cardona display the true colors of Colombia. 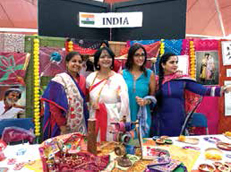 (From left to right) Sayeeda Waheed, Tapoti Neogi, Roshmi Dalal, and Zaiba Riaz stand behind a table with a colorful display of arts and crafts from India. 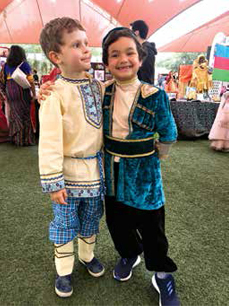 Eye-catching costumes donned by parents and children of different cultures stood out at the fair where students learned to fold Japanese origami, use chopsticks, write Chinese calligraphy, play Malaysian marble games, speak French, Tagalog, and others. “I like everything, but I mostly like the food,” said seven-year-old Gabriela Bautista. Sampling food from each country was everyone’s must-do activity while a food truck and a shawarma stand were there to top up visitors’ stomachs. “We want to make sure people are fed because it runs through dinner time,” said Pugh. “It’s a great event, very well organized. Almost all the countries participated in this with lots of support from parents,” said Aadil Nabi, a father of three children. 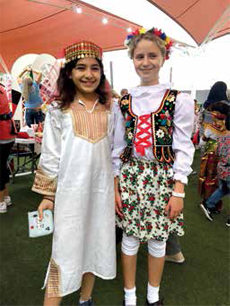 Mona Najjar (left), dressed in a traditional Lebanese outfit, and her friend from Poland, Kalina Sliz, pose for a photo at the International Day. 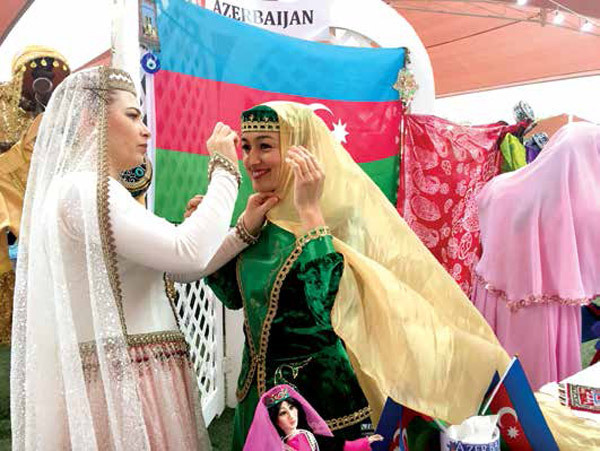 Ramy Ezzat (right) and his friend Maxim Torlov show off their traditional Azerbaijan outfits. 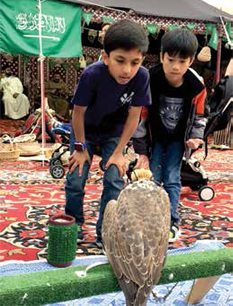 Tanner Wong (right) and Danish Malik gaze at a falcon perched on a stand as part of the Saudi Arabian cultural display at the International Day. 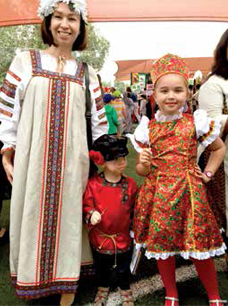 Alia, Ali, and Adelya Ayneldinova display Russian attire during the International Day. One special area was carved out to display the culture of Saudi Arabia, sponsored by the Community Services Department. Inside the tents, the department provided activities such as Henna design, an introduction to the sport of falconry, Arabic calligraphy, arts and crafts display, traditional cuisine, demonstration of flat bread making, weaving, dance, and a photo booth. “Saudi has the biggest display. If there were a contest between each nation, they are going to win,” said Nabi. Industrial Security officers were there to campaign for safety awareness while a special search unit introduced two K-9 dogs and explained their work to the children. Other than the outdoor activities, a lineup of indoor performances were held in the school gym, including a Bollywood dance, a Latino performance, choirs, and a parade with children carrying different national flags.